Action//Adventure/Drama/History, UK/Norway/Denmark, 2012, 118 min. Tagline Real adventure has no limits. Synopsis The Norwegian explorer Thor Heyerdahl crossed the Pacific ocean in a balsa wood raft in 1947, together with five men, to prove that South Americans already back in pre-Columbian times could have crossed the sea and settle on Polynesian islands. After financing the trips with loans and donations they set off on an epic 101 days long trip across 8000 kilometers, while the world was waiting for the result of the trip. The film tells about the origin of the idea, the preparations and the events on the trip. Kon-Tiki was named after the Inca sun god, Viracocha, and "Kon-Tiki" is an old name for this god. Heyerdahl filmed the expedition, which later became the Acaemy award winning documentary in 1951, and wrote a book about the expedition which was translated into 70 languages and sold more than 50 millions copies around the world. Heyerdahl believed that people from South America could have settled Polynesia in pre-Columbian times, although most anthropologists now believe they did not. Anyway he proved it was possible, by using only the materials and technologies available to those people at the time. The trip took 101 days over 4,300 miles across the Pacific Ocean before Kon-Tiki crashes into the dangerous reefs outside Raroia in the Tuamotu Islands on August 7th 1947. 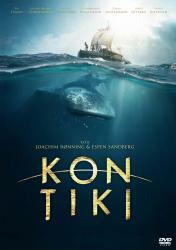 They all succeeded, and Kon-tiki was brought back to Norway and is no featured in the Kon-Tiki museum.